As mentioned before, a contrasting color between tile and grout would be attractive. In general, most ceramic tiles are light colored. So a black colored grout would fit most needs. It just so happened that my son's instruction was to use cement and cement is gray colored. That's the reason we initially chose gray. In the second phase of the project we actually coated the gray grout with black. It is not too difficult for as long as the initial grout hasn't been sealed. Also, coating a black colored grout over a light colored one would be more easily achievable than the other way around. This is used to seal and coat the joints in between the tiles. 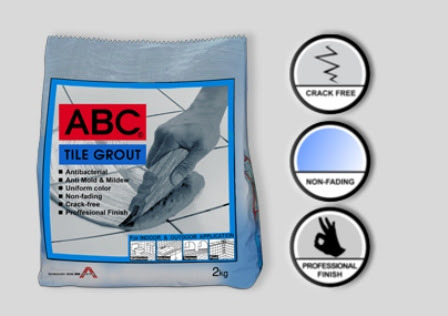 Grout sealer is a thin liquid and is actually sprayable. This seals the grout in so it is more durable and won't absorb water. Some would skip this part and leave the tile grout as is. Aside from making the grout more impervious, the grout sealer also leaves a slight sheen on the tile grout. Grout sealer may be a bit expensive for "open areas" or those parts of the pot that don't have tiles. A cheaper alternative that can be used on the garden clay pot's rim and inside, or anywhere not near the tiles is elastomeric sealant. Hammer - This is to easily break tiles into smaller pieces. Hard flat surface or a weight plate - You'll be breaking ceramic tiles into smaller pieces with a hammer so choose a hard surface that won't be damaged. An alternative would be to place a gym weight plate on the ground and use that. Plastic bins or containers - Old ice cream plastic containters are good. For this project, they have multiple uses like for holding the broken tile pieces, mixing grout, holding water, etc. Caulking gun - Use this when applying sealant to glue the tiles on the garden clay pot. Tile cutter or heavy tin snips - Remove very sharp corners of broken tiles or reduce the thickness of the tile edges. Sponge - Use an old kitchen sponge used for washing dishes. Rag - An old piece of clothing (t-shirt) will do. Spatula or mixing stick - To be used on applying sealants and mixing tile grout. Flat Screwdriver - For wiping dirt or scraping debris on tile pieces. Choose a tile piece to break into smaller pieces and a weight plate on the ground, if a hard surface is unavailable. Put the weight plate flatly on the ground. Place a thick paper or brown bag over it. 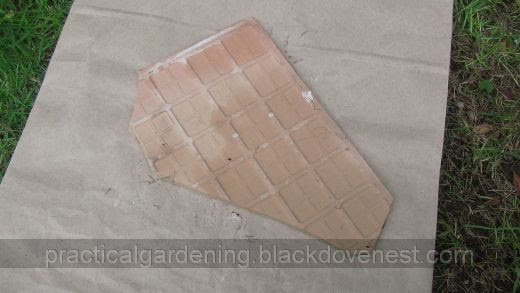 Then place a piece of tile over them as shown below. 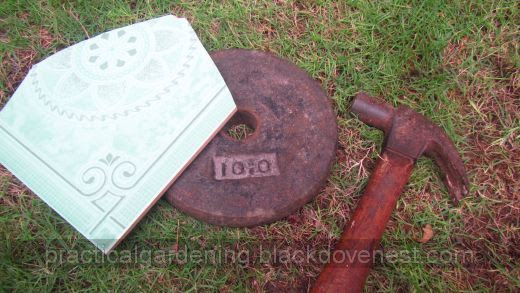 The thick paper will collect the unusable tiny pieces, dust and debris from all the hammering. It's then easy to dispose the debris. 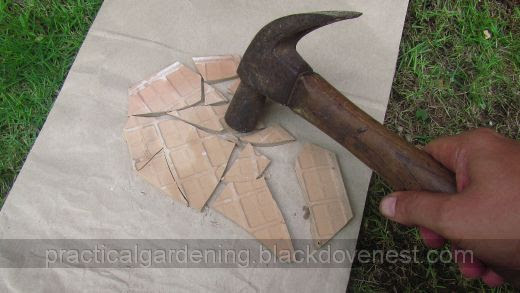 With the glazed side of the ceramic tile face down, use a hammer to pound and break the tile into smaller pieces. By having the ceramic tile face down, this glazed surface of the ceramic tile is less likely to shatter or crack.